Everyone loves invention in this industry, and dbnAudile had great opportunity to show some real rigging finesse at Manchester’s Whitworth Art Gallery – just re-opened in a blaze of glory after a £15 million revamp that includes a brand new wing and some completely unique new gallery spaces reimagined from previously enclosed areas of the building. 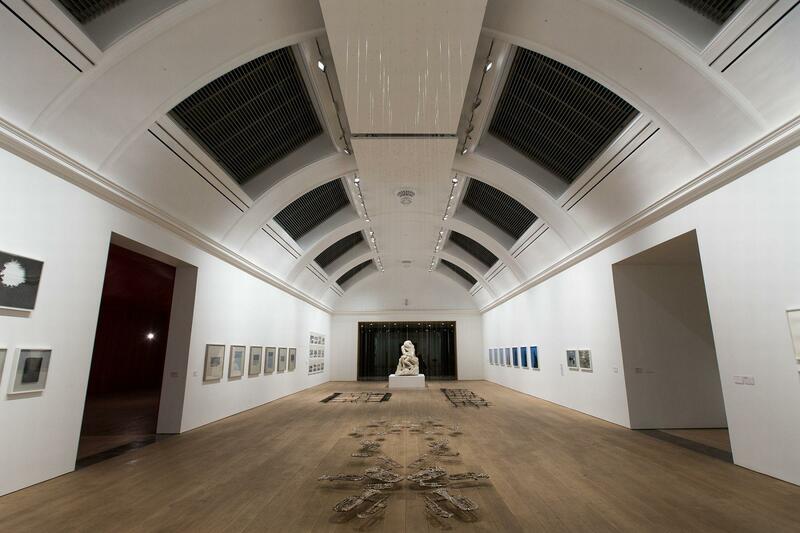 dbnAudile have worked on various projects at the Whitworth over the years. dbnAudile’s Nick Todd joined the Gallery’s own installations team to mastermind the rigging of four specific elements of the current permanent exhibition by sculptor and installation artist Cornelia Parker into the fabulous newly refurbished Gallery 6, 7 and 8 spaces. 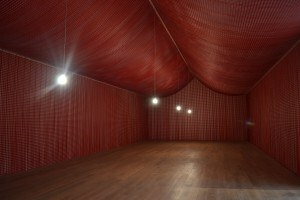 This iconic work was created by Parker in 1991, and comes complete with its own grid to which the thousands of fishing line wires are attached to suspend the shed fragments in the requisite positions. It weighs half a tonne, so dbnAudile designed a mini-grid from Litebeam truss and a discreet steel wire suspension system. Once again, the grid was moved into position on motors allowing connection at ground level, and once in place, deaded off and the motors removed. “Our equipment was always going to be visible on this one but its simple, functional design was appreciated”. Also lit was the new intricate, precise, and slightly unnerving “War Room”. The 20 metre long piece resembles an apex roofed marquee in shape with the walls and ceiling constructed out of long drops of blood red paper made from recycled waste from the factory that manufactures the 45 million Remembrance Day poppies sold each year. It is lit by four stark hanging light bulbs. dbnAudile’s brief was to devise a system whereby the gallery staff could work on constructing this piece at ground level, which could then be raised up. The lines of fabric had to sit with 12 mm spaces between the outside edges and the next layer in, and all be perfectly lined up so they are seamless with only one layer of fabric visible to viewers. When this task was completed, the ridge truss was flown out to the desired height, deaded off, and the motors removed. The gallery crew then diligently lifted the material and secured each of the material drops on the side positions forming the apex shape running along the centreline of the work. Two other works which tested dbnAudile's rigging skills are both suspended in Gallery 7. 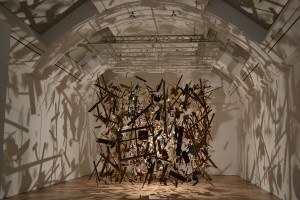 “Composition With Horns (double flat)’” is created from 16 old brass band instruments, squashed flat in an industrial press and hung from wires close to the floor, while “Accidental I” features 52 silver objects crushed in a heavy steam press, also suspended on separate metal wires in a similar fashion. 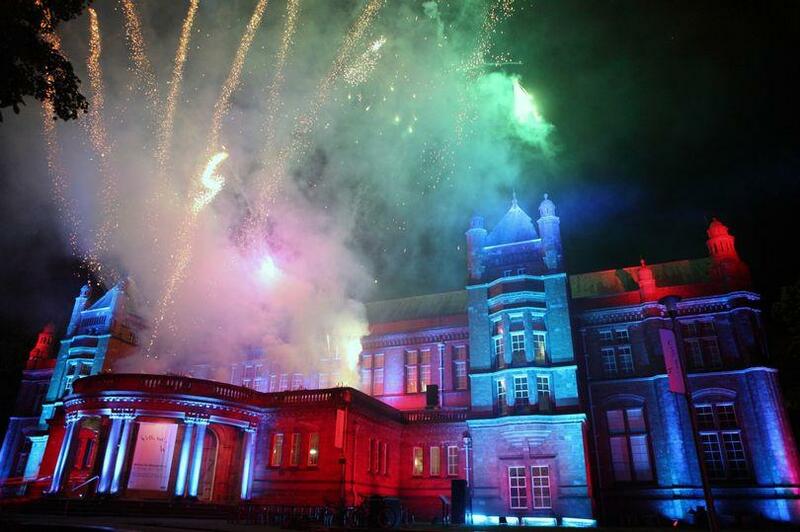 For the high profile re-opening show, dbnAudile provided exterior illumination for the Gallery’s new extension utilising SGM P5 LED floods and Studio Due CityColor LED floods. The Halle Youth Choir’s performance was lit with Spectral Zoom LED Pars and Clay Paky GlowUp battery powered LED units.